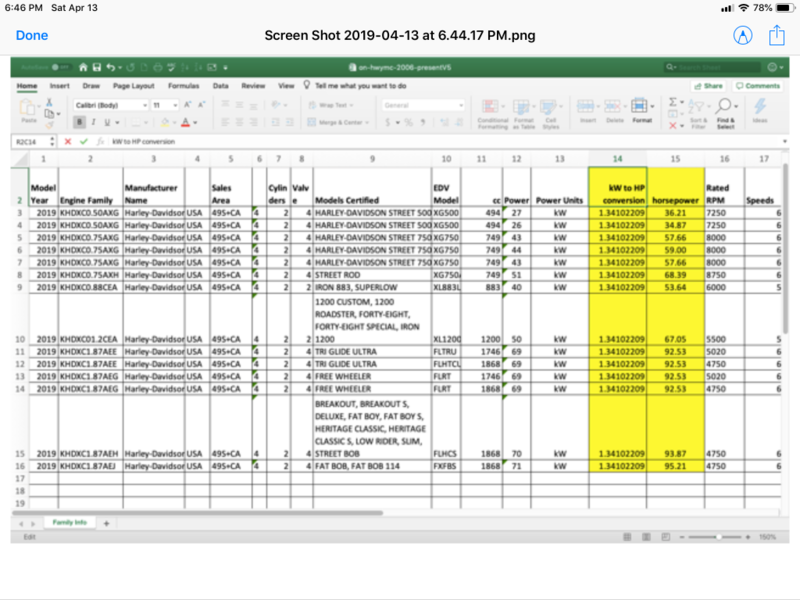 From EPA Certification-Data spreadsheet, numbers for 2019 H-D models. H-D listed power data in kilowatts. I added the highlighted columns to convert the power data to horsepower. I deleted a lot of columns to reduce the width. - Sportsters are the only H-D models with 5-speed transmissions. Last edited by jzink0883; 1 Week Ago at 14:39.. Thank you! That is a fantastic spreadsheet with so much data. I never knew the EPA published that much data. 750 street rod hp is the same as a 1200. Is this a typo or is the Street Rod a blast?? The regular 750 is 11:1. I believe the red line is 9000 rpms. Max power is at about 8700 rpms. High RPM'S Low to mid torque. Sounds like a metric crusier. Except less comfortable.